The U.S. Army Corps of Engineers reported that between Jan. 1 and May 31, 2016, California and Steller sea lions ate an estimated 9,000 adult Chinook and steelhead in the Columbia River at--and downstream of--Bonneville Dam. By the end of May, Corps personnel observed only one sea lion munching on fish in the stretch of river from the mouth to the dam. From May to August, sea lions leave the river's freshwater for the Pacific Coast for breeding season. The 2016 sea lion take of salmon and steelhead was about twice the 10-year average, the Corps said. 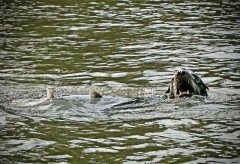 Also observed was sea lion predation on 231 lamprey and 86 sturgeon. On May 4, Corps staff counted 120 sea lions, surpassing the previous one-day record of 116 on April 22, 2015. Sea lions ate about 5.5 percent of the estimated 2016 return of Columbia River salmon and steelhead, the Corps said. In addition to the annual dam and boat-based hazing to discourage pinniped predation, sea lion exclusion devices were installed last fall and this spring at Bonneville's powerhouses 1 and 2. This year wood panels were placed over the floating orifice gates at powerhouse 2 after Steller sea lions were seen entering the fishway last year via orifice gates. The Corps report found no new evidence of sea lions penetrating the fishway. Washington and Oregon fish managers removed 59 California sea lions in 2016 under a federal permit. The permit issued by NOAA Fisheries to the states of Oregon, Washington and Idaho expires June 30. The states have applied for a five-year extension of their current permit, which allows lethal removal of California sea lions under the Marine Mammal Protection Act. A task force that includes members of the public as well as fish managers met recently and will issue a report June 22 to help inform NOAA's decision on the permit extension. NOAA is expected to decide by June 30.